If the rest of you pregnant ladies out there are going through what I’m going through, then I’m quite frankly a little concerned for the survival of the human race, which in my case is currently being formed by a strict diet of sour cream & onion potato chips. I’d like to blame my crazy-dream-filled nights for my bone-tired exhaustion during the day. I know that exercise would probably help. But, the fact remains that the only exercise I can seem to manage right now is lifting my fork to my mouth. I really can’t go more than two hours without eating something substantial. And, by substantial, I’m not talking about the recommended “extra 300 calories” of nutrition you might find in a banana and a cup of yogurt. I’m talking plate of pancakes. Side of beef. Today, I actually had a craving for salad. I’m pretty sure I could drink the salad at our local Bertucci’s. 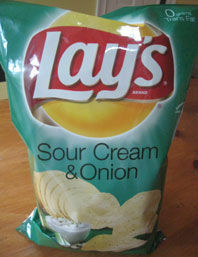 At least it's not sour cream and onion potato chips. I'm making progress here.